GREAT BARRINGTON, Mass. — In an age where our attention often frays and never lingers, it is rare to find something that holds it unwaveringly for 60 minutes. Andrew Schneider’s performance of YOUARENOWHERE leaves little time for the mind to wander. Frenetic strobe lights, crackling sound, and a fast-talking man sponged in white paint toy with every possible meaning of the show’s title. YOUARENOWHERE questions what it is to be present, in both a literal and philosophical sense. It riffs on the modern way of life and our dependence on technology. It warps our sense of time and self. It leaves us wondering whether we are here now or if we are nowhere. The show begins by surrounding the audience with sound — something between an insect’s hum and the fluorescent bulbs in a gymnasium. The lights flicker on and off, garbled voices whisper and overlap. A shirtless Schneider appears with wired boxes taped to his arms and wears a microphone headset. “Hey, so we should probably talk sometime soon about what’s happening,” he says. The lights go out again. They come back — blue this time. Schneider frames himself in a hanging metal square — the only thing on stage aside from him — and sings “Lonesome Town” by Ricky Nelson. The lights go out. The hum is back. So are the voices. The sound changes to radio fuzz. Schneider reappears. He addresses the crowd directly and launches into a schizophrenic monologue. Despite the chaos of the next hour, Schneider manages to interlace his words and movements with great meaning. He comments on the nature of time and space by quoting physics textbooks and challenging the audience’s own sense of time by projecting an inaccurate countdown clock during the first half of the show. He meditates on all that keeps us up at night — life, death, dependency, relationships, etc. Schneider slowly deprives the audience of logic — first, time becomes insignificant, then space, and, finally, Schneider himself. Half-way through the show, a shocking twist leaves us questioning our own sense of reality and presence in that very moment. In YOUARENOWHERE Schneider succeeds at bringing the audience into the parallel universe he spent years designing. 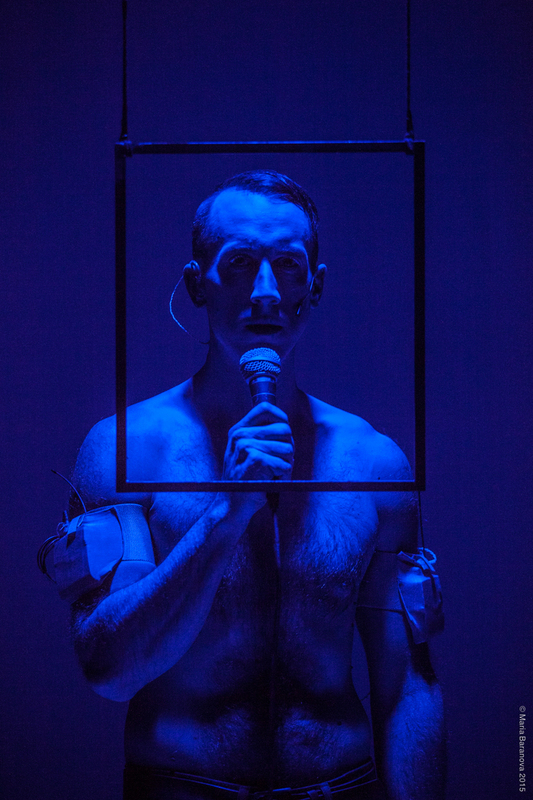 An experience in sensory deprivation and overload, Schneider has crafted a show that uses and questions technology at the same time. Schneider is an artist who creates theater, videos, and installations that examine the “intersection of performance and technology.” A former member of the New York City-based Wooster group, he holds a master’s degree in Interactive Telecommunications from New York University and a BFA in Theater from Illinois Wesleyan University. 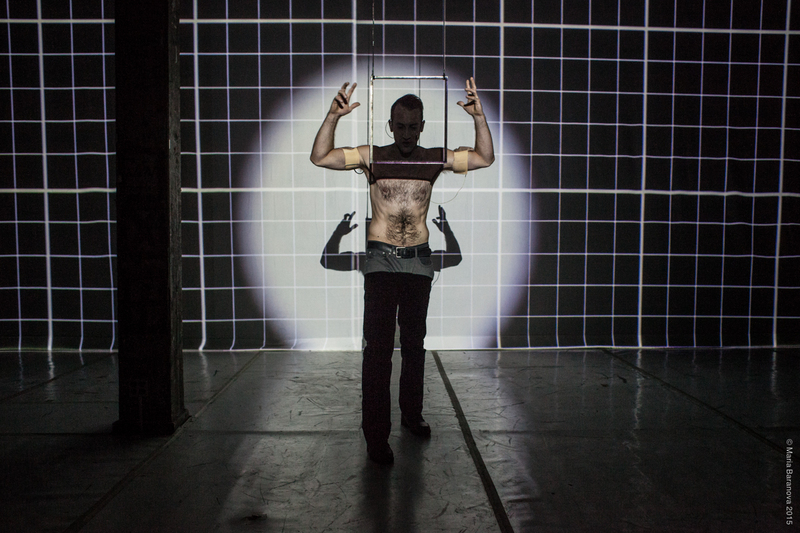 YOUARENOWHERE premiered in its current form at PS122’s COIL Festival in January 2015 and won an Obie award in May under the Special Citations category. Schneider had been working on it, and performing parts or variations, for years. Most recently, YOUARENOWHERE showed for three nights at the Mass Live Arts festival in Great Barrington, Massachusetts, a festival devoted to bringing experimental theater and performance to the Berkshires. YOUARENOWHERE began as a lighting concept. Schneider wanted to hyper-cut reality, a vague term that floats around high-level math classes and the electronic dance music scene. For Schneider, hyper-cutting describes an intensely chopped-up image or scene. Imagine a video that flickers between different images by the second. Schneider spent hours programing lights in his apartment and designing custom LED systems. Over the years, he worked on the project on and off. Like a rolling ball, it picked up parts of him and his life. In 2014, inspired by the sharp, declarative sentences in French writer and photographer Édouard Levé’s radical self-portrait Autoportrait (2002), Schneider populated the second half of his performance with personal statements confessing everything from past addictions to lost love. Like Levé, Schneider wishes to bare himself completely by releasing everything about himself into the world with no fear of judgment. The things Schneider says are eerily applicable to most of us. The result is an unexpected rumination on not just what it means to be here, now, in a noisy world, but what it means to be human. For a man troubled by our de-humanizing relationship with technology, Schneider has succeeded at harnessing it to question, negotiate, and discover performance. Between all the noise and all the screens, YOUARENOWHERE demands you be present and connect with reality in that moment — all before overturning that moment in the name of realizations about selfhood. For Schneider, studying presence, perception, physics, and parallelism has changed his outlook on life. He believes it makes the little things we worry about seem insignificant. In YOUARENOWHERE, Schneider stuns viewers into questioning and renegotiating their own perspective and sense of self just as he has, with the hope that they’ll grow a bit because of it. YOUAREHERENOWHERE ran July 9–11 at Mass Live Arts (84 Alford Rd, Great Barrington, MA). The performance will go on tour, beginning with Slovenia at the end of August, and then on to Melbourne, France, and Croatia.